If you own a Volkswagen you already know that translated, Volkswagen means “People’s Automobile”. As a Volkswagen owner, you want style, performance, and sophistication, but you are also a practical person. Value is also part of your lexicon. The iAUTOHAUS BOSCH Authorized Service and Repair Center in Tempe, Arizona is here to assist with all of your Volkswagen repair needs. We work on all of the Volkswagen models, Jetta, Passat, CC and Touareg. Our ultra-clean facility is housed with the newest factory diagnostic tools and we always use quality OEM or manufacturer parts. Our service advisors are friendly, personable and able to answer all of your questions! Rest assured, your VW will be in the caring hands of one of our Certified Master Technicians- each take pride in the work they do. Take advantage of our free shuttle or relax in our comfortable waiting area offering WiFi and you can expect a clean, hand-washed vehicle upon service completion. 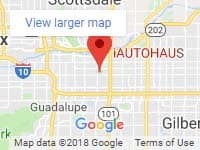 If you live in Tempe and need repairs on your Volkswagen or if you live in Scottsdale and need Volkswagen service iAUTOHAUS is here for your needs. Interested in exploring other European brands? We have new cars every week and we feature a large selection of BMW, AUDI, Mercedes-Benz, Porsche, Land-Rover and much more! Our vehicles are affordably priced, with price points suitable for any budget! Competitive financing is available OAC as well as quality, extended warranties!